Having only published The Blue Guitar late last year, another novel from the pen of one of Ireland's most distinguished writers is something to look forward to. However Galway should not expect to hear any extracts from this latest Benjamin Black when Banville reads at the forthcoming Cúirt International Festival of Literature. "I never read in public from BB - can't find a voice for him, mysteriously," he explains. Banville will read from The Blue Guitar at this year's Cúirt, and indeed he is no stranger to the festival, having read at the event numerous times over the years. His most lasting memory from previous Cúirt appearances embodies the old adage that 'You never forget your first time'. "A funny memory I have," he says, "I think it must have been my first time at Cúirt, is of being about to launch into my reading when two people in the centre of the audience very ostentatiously stood up and walked out. At the time I was books editor of The Irish Times, so probably it was a disgruntled author or publisher and spouse." The Blue Guitar examines the life and complicated loves of Oliver Orme, a one time painter and occasional kleptomaniac, and the fall-out from his affair with Polly, the wife of his best friend. Throughout there are references to climatological disasters which have wreaked havoc on parts of the globe and downed digital and mobile communications, seemingly for good - "I have no desire to write about a world obsessed with these new toys," he says, adding, not unreasonably, "within a generation people will look back and smile patronisingly at our current excitements." Despite all this, life still goes on, just at the pace of earlier times. Banville, against the current vogue, clearly resisted the temptation to make The Blue Guitar a dystopian novel. "I loathe dystopian novels," he declares. "Life does go on. I saw an amazing set of photographs taken before and after that catastrophic earthquake in Japan some years ago: a highway destroyed in the 'quake, and, a week later, the highway completely restored. It's our great strength, to keep going on, as all tyrants and nihilist bombers discover." The setting for the book is clearly Ireland, but that comes mainly from a few sparse, scattered, clues. It produces a slightly disorienting effect on the reader, more used to novels located within a very specific time and very specific place. Nonetheless, this approach ensures Banville had little restraint on how he imagined his characters and where they lived. "Yes, I have always sought to strike through the surface of life in an effort to get at least a little bit closer to essentials," he says. "What I always say is that as an artist I am interested not in what people do but in what they are." While The Blue Guitar charts Oliver's emotional states and situations through his affair with Polly, its ending, and the uncomfortable truths he has to face about himself in its aftermath, the narrative is kept very loose. The book is filled with stories, but not an overarching plot or story in the traditional sense. "As Raymond Chandler said, it doesn't matter a damn what a novel is about, the only thing that counts is style," Banville says, when I ask him about the importance of language over plot, and of his interest in vocabulary. "As to plot: has life got one? Not that I know of. Language is our defining gift, and the sentence is our greatest invention. Words alone are certainly good, says Yeats, and I agree. But I should emphasise I am interested in words, not for their own sake, but for the sake of richness of expression, delight for the reader, and accuracy. Tyrants love simple language; and they positively love inaccurate language, which, as George Orwell pointed out, is always a sign of lazy thinking." As with The Book of Evidence and Ghosts, painting features strongly throughout The Blue Guitar. Banville loved painting in his teenage years. Is it still something he would love to be able to do? "Oh, no, not at all," he says. "I did try to be a painter when I was a teenager but I discovered I had no talent for it whatsoever. I don't regret the effort, because like all efforts it taught me a number of things: in particular, it showed me how to look at the world with a painterly eye, which is useful for a novelist." With that in mind, might Banville draw inspiration from paintings for his books, as much as literature? "I interviewed [French photographer] Henri Cartier-Bresson in his old age, and I asked him, of all the modern artists he had known - and he knew pretty well all of them - who did he think was the greatest, and without hesitation he said, Bonnard. I agree with him. You know Picasso never ceased railing against Bonnard's work? Because he knew how good it was, and was furious at him for it. As to inspiration, I have no idea where it comes from - dreams? The older I get, the more the world of dreaming seems to me an entirely other version of life." Banville has been writing crime fiction under the Benjamin Black pen name since 2006, with the publication of Christine Falls, and has since followed this with eight other titles. How rewarding has he found this experience? "It uses up the summers," he says. "Summer is the most boring of all the seasons - nothing happens - so I stick to my desk from May to September and write a BB. Of course, BB was supposed to do my day job for me, after I left journalism. I wish he'd hurry up and start doing it, so Banville can wander off into his dream world…"
It seems a very strange thing for a writer of Banville's stature to say, but it was when he started writing as Benjamin Black, that he said he realised he could write a novel. "I have never really thought of myself as a novelist, since I'm not very much interested in how or why my characters act as they do," he replies. "I suppose I see myself as an artist who happens to work in the novel form. Does that sound pretentious? But where would we be, and how far would we get, without our pretensions?" Banville is passionate about crime fiction and has refreshingly little time for those who condemn the forms finest writers and novels with the term 'genre-fiction'. He expounded on this in an interview with The Los Angeles Review of Books in 2014: "My ideal bookshop would have no sections…all the books next to each other. You would discover things. I hate genre. Some of the best writing of the 20th century was in crime novels. James M Cain, Raymond Chandler, Richard Stark, Simenon of course - this is wonderful work, and shouldn’t be put off into a ghetto." 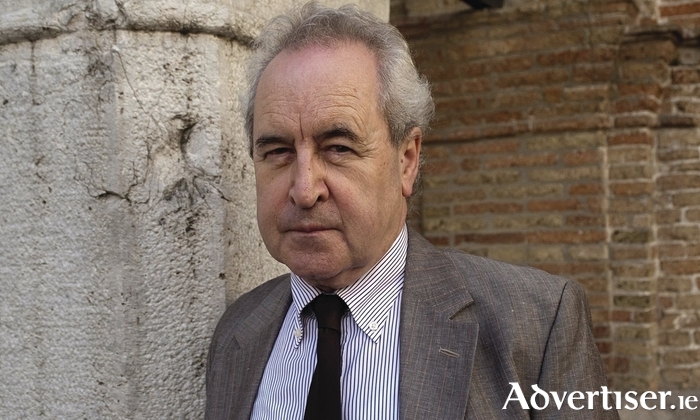 I ask Banville why he believes that resistance and prejudice against crime fiction persists? "We all like lists and enclosures, which make the world seem less formidably diverse and incomprehensible," he says, "but it's a great pity that intellectual snobbery keeps many readers away from the likes of Georges Simenon, who, at least in what he called his romans durs, or hard novels, was one of the greatest writers of the 20th century."